Spiritual Evolution of the Bean: Frequently Asked Question: How did you start making mandalas? Frequently Asked Question: How did you start making mandalas? 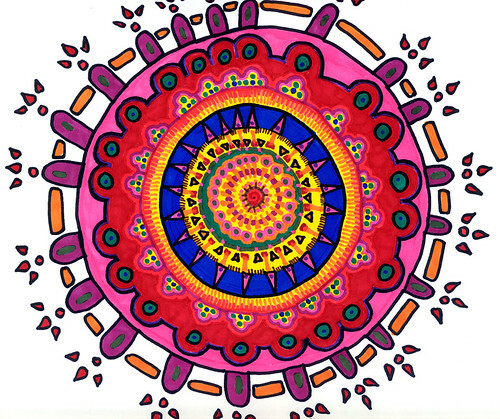 How did you start making mandalas? This was at the beginning of 2007- right around the time I was becoming much more serious about personal growth and once I tried this “meditation”, I was instantly hooked. I had already learned to access what I like to call “my higher self” through drumming and the repetition of energetic mantras so it was easy to see how this circular art form would become a natural extension of the work I was already doing. With my brain constantly working in hyper over-drive, the rhythmic nature of these creations has been one of very few things which has allowed me to shut down the chatter. “Finished in one sitting” meant instant gratification and that’s something I needed at that time - to see physical proof of my transformative progress. And since the description of this exercise didn’t offer any specific rules on the construction of the mandala beyond working from the center out, this gave me permission to make them in any way I desired without ever feeling like I had to judge their quality. By removing the element of self-judgment and critique often connected to traditional art making, mandala art would prove to become a huge foundational element in helping me open up not only to myself, but also to future artistic possibilities. Mandala above was the first I'd consciously created 01/06/07 after learning of the mandala meditation.